I love all Christmas "flavors." Chocolate peppermint, eggnog, cranberry, cloves, cinnamon, orange, etc. You get the point. But my favorite Christmas flavor of all? Gingerbread. 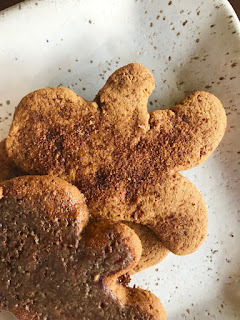 I love the flavor of ginger in general, but once you add in molasses and other warm and cozy spices, it takes it to a whole different level. 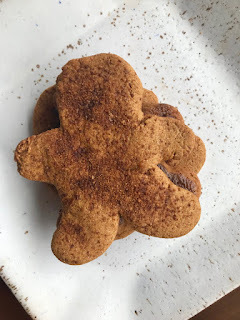 Even as the intense choco-holic that I am, gingerbread still trumps hot cocoa ANY day for me. 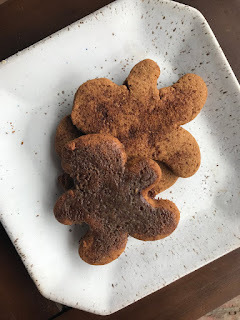 Gingerbread lattes, gingerbread cake, gingerbread men... I accept it any form. My grandma has the BEST gingerbread cake recipe, which I actually used in my Christmas Truffles. I look forward to it every year, and you can bet I'm dreaming about it this very minute. 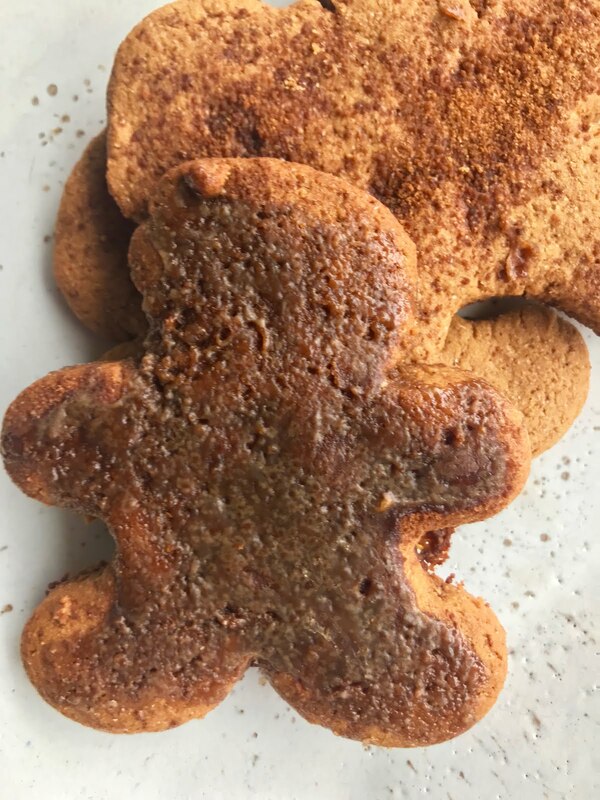 I wanted to put a little twist on the traditional gingerbread men cookies that are so dear to my heart around this time of the year and make something maybe a little bit more acceptable for breakfast. This way I have an excuse to eat gingerbread at all times of the day. Although, I would never turn down a gingerbread cookie or a slice of my grandma's cake first thing in the morning. I used slightly healthier ingredients to make it even more fitting for a balanced breakfast-- spelt flour, coconut oil, coconut sugar, etc. But I also included some substitutions for more everyday pantry items so you don't even have to make a trip to the store to make these babies. 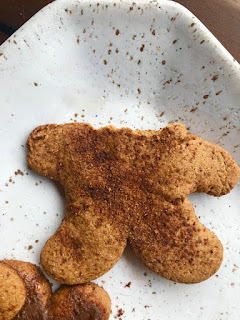 With the looks of a gingerbread man, the texture of a hearty crunchy-on-the-outside-cakey-on-the-inside scone, and all of the beloved comforting ginger and spice flavors these scones are everything I could dream for in a Christmas cookie... but they're not very sweet. The maple-espresso glaze obviously gives it a burst of sweetness (and a little punch of caffeine), but the scone itself is pretty savory. I think it has just the right amount of sweetness to bring out the gingerbread flavors, but it also isn't overpowering--again making it a perfect (and festive) breakfast option for the holidays. My whole family prefers a more faint ginger spice flavor, actually they aren't huge on gingerbread all together. I, on the other hand, like a nice spicy, robust ginger flavor to really stimulate your tastebuds. I contained myself enough to only add in a normal amount, though, and my family actually really liked the flavor of it! Okay, now about this glaze. We all know how much I love all things coffee. I was trying to come up with a fun glaze, and something was telling me that I needed to add espresso into it. I went with it, because I never doubt the power of coffee. And I loved it. Maple and espresso is probably one of my favorite combinations now. Since this is a "healthier" scone, I used coconut cream in it (you don't even taste the coconut), but regular heavy cream will work too. This glaze is pretty much just like a sticky caramel sauce, and let me tell you... it's addicting. I could eat it right out of the scorching hot pot. Which I don't recommend only because you will burn your tongue so bad that you won't be able to soak up all of the incredible flavors running through these scones when they're finally ready to devour. 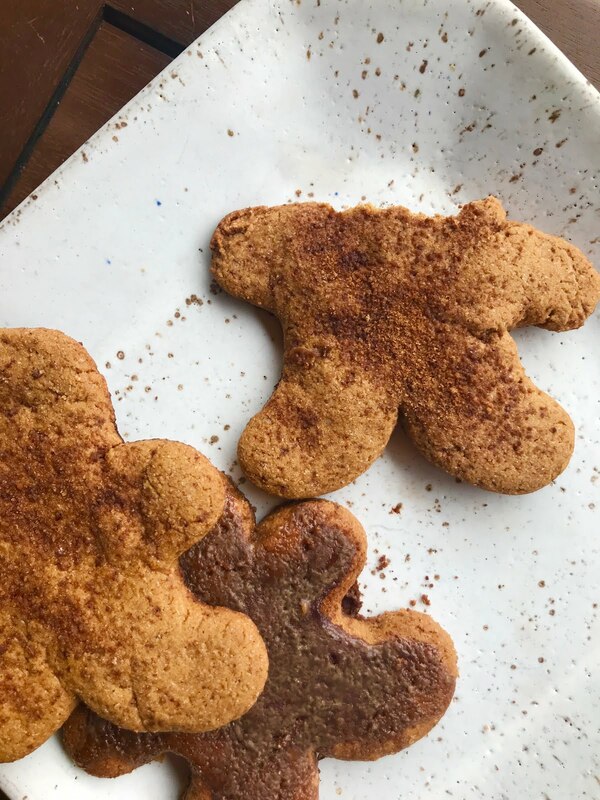 The cookie itself becomes a little softer with the glaze, so if you want a totally crunchy exterior, just bake the scones for about 15 minutes at 325º and then drizzle with the glaze before eating one! I also like the dry ones with powdered sugar or some butter + jam on top. We received a jar of this Holiday Jam as a gift and, honestly, I couldn't imagine something tasting more like Christmas than when paired with these scones. Also, I highly suggest eating one of these with a cup of coffee or espresso-- such a yummy mid-day pick me up! Bring the maple syrup and espresso together in a saucepan, bring to a low boil, add the coconut cream, and simmer for 5 minutes--stirring often--and then turn off heat and let cool to thicken. It should be runny enough to drizzle and spread, but thick enough to pass the spoon test (dip the spoon in the glaze, swipe your finger down the middle of it, and hold it sideways to make sure the top half of the glaze doesn't drip onto the bottom half. Mix all dry ingredients together, including the sugar. Either pour in the melted coconut oil or cut in the butter cubes until a rough dough forms. Add in the water and molasses and knead until a dough forms. 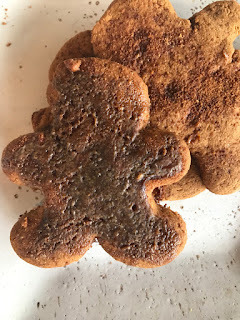 Flatten into a 1/2 inch thick square and cut out gingerbread men, repeating until all dough is gone. Place on a lightly greased baking sheet, sprinkle with brown sugar or coconut sugar, and bake for 10 minutes. Let cool for 5 minutes, spread a thin, even layer of the glaze on top of the scones, leaving a 1/2 inch border without the glaze. Bake at 350º for another 7-10 minutes, or until the glaze is bubbling. Let cool completely. Store in an airtight container in a cool, dry place.